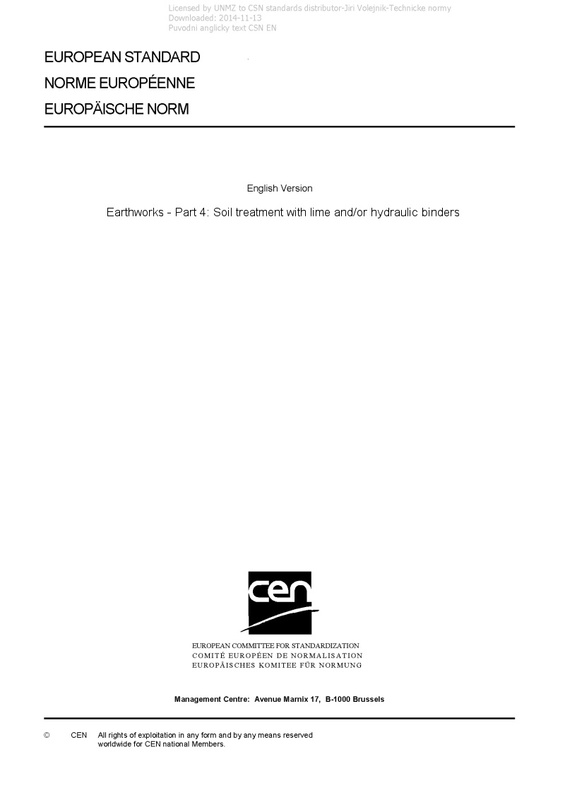 EN 16907-4 Earthworks - Part 4: Soil treatment with lime and/or hydraulic binders - This European Standard applies to the treatment with binders of natural soils, weak rocks, intermediate rocks, chalk, recycled materials and artificial materials for the execution of earthworks during the construction and maintenance of roads, railways, airfields, platforms, dykes, ponds and any other types of earth structure. It relates only to the treatment in layers, produced for earthworks in situ or from a mixing plant, as opposed to the treatment by columns for example. The standard specifies the requirements for the constituents of the mixtures, the preliminary laboratory testing methodology, the laboratory performance classification, the execution and control. NOTE 1 The informative annexes also give example of good practices for execution and control. The laboratory performance classification specified in this European Standard covers the two types of treatment: improvement and stabilization. For improvement, the classification relates to the short term performance. For stabilization, the classification relates to the medium to long term performance. NOTE 2 FprEN 16907-4 prepared by CEN/TC 396 “Earthworks” is for improvement and stabilization in earthworks applications. EN 14227-15 prepared by CEN/TC 227 “Road materials“ is for stabilization only in pavement applications. NOTE 3 For stabilization, the performance classification specified in FprEN 16907-4 uses generally the same laboratory performance classification specified in EN 14227-15, except for the performance classification diagram according to “Rt and E” specific to pavements in EN 14227-15, which has been replaced in FprEN 16904-4 by a performance classification diagram according to “Rt and E” specific to earthworks (Figure 1).